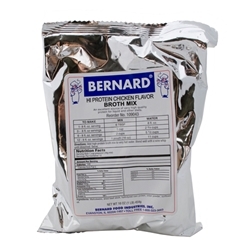 Bernard Broth is ideal for clear liquid diet with extra elctrolytes. The mix dissolves instantly in hot water and is an excellent source of nutrition. Ingredients: Maltodextrin, dried beef stock, hydrolyzed corn protein, onion powder, sunflower oil.